The waiting is finally over. Today our Christmas market is solemnly opened by the musicians and the angels of light. Today St. Nicholas comes and, accompanied by the angels of light and the musicians of our Christmas market orchestra, welcomes all visitors, small and big, and presents delicious sweets. 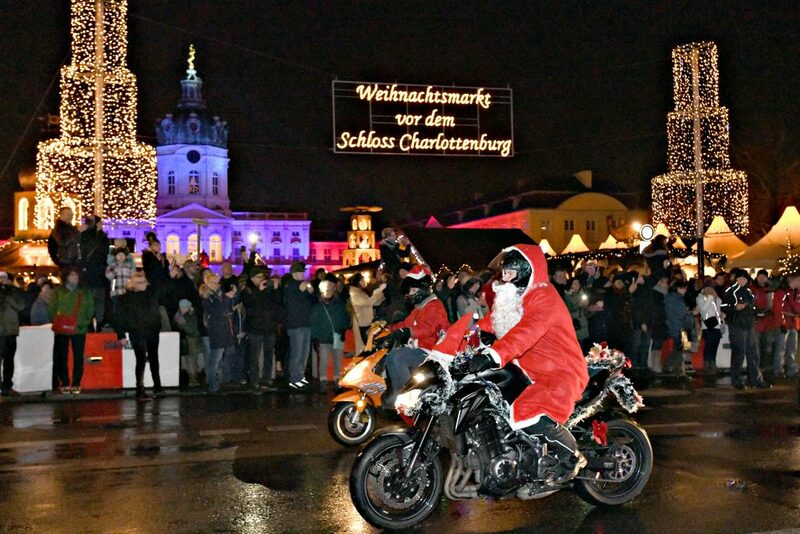 It is already a tradition that the Christmas bikers – Santa Clauses on the motorcycles – end their Christmas market tour under the motto “Biker helping needy” at our Christmas market. Stop by and listen to the launch of over 500 Christmas-decorated motorcycles. 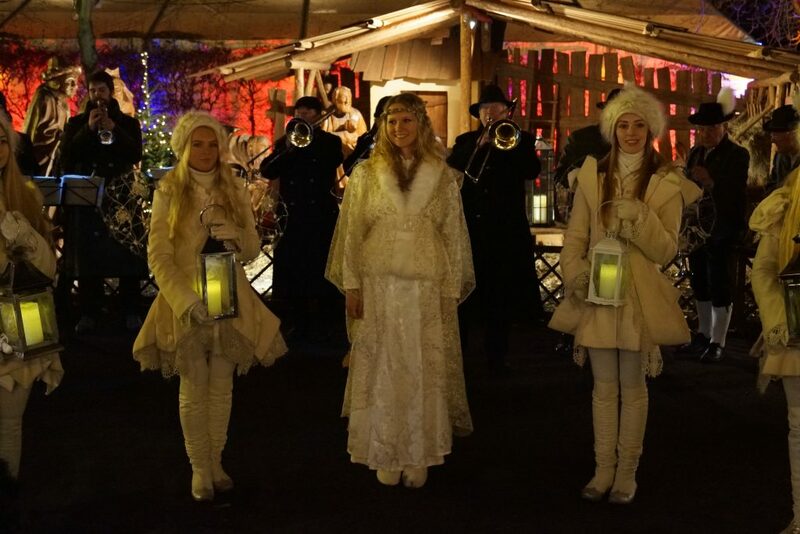 Our partner Christmas market of Palace Thurn und Taxis in Regensburg visits Charlottenburg with the Christ Child and an original Bavarian brass band. Peter Kittel, who has been commissioned by Her Highness, Princess Gloria von Thurn und Taxis, has developed the romantic Christmas market at the St. Emmeran ancestral castle into an international brand. 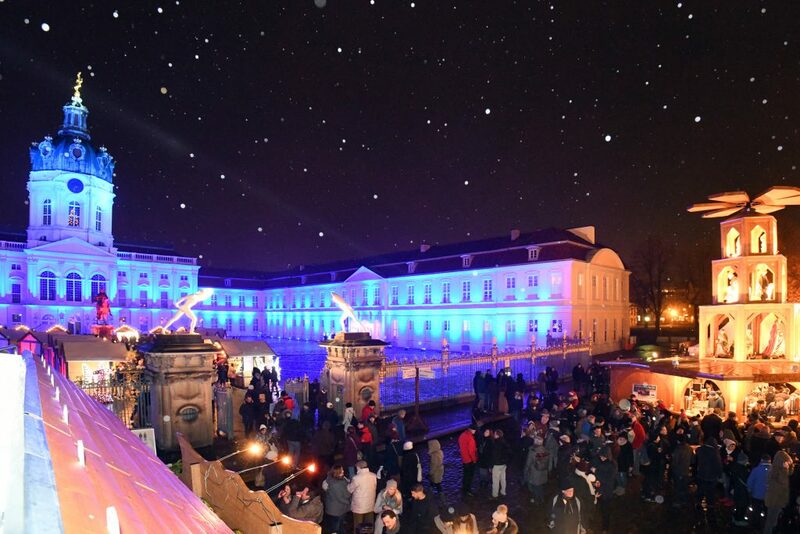 Entry to the Charlottenburg Palace Christmas Market is free! Due to the large visitor numbers, the best times for a quieter stroll through the Christmas market are the early afternoon or midday on weekends. We recommend that all visitors take public transport! The Christmas market is just a few minutes’ walk from the Sophie-Charlotte-Platz or Richard-Wagner Platz U-Bahn stations and the Westend S-Bahn station. Several bus and taxi ranks are located just outside the main entrance on Spandauer Damm. Parking bays are available for tour buses on Spandauer Damm, though these fill up quickly. Out of consideration to residents, we recommend parking in the less frequented Sophie-Charlotte-Strasse (entrance off Spandauer Damm northbound, parallel to the highway), heading towards Güterbahnhof Charlottenburg, if a car or tour bus are unavoidable. 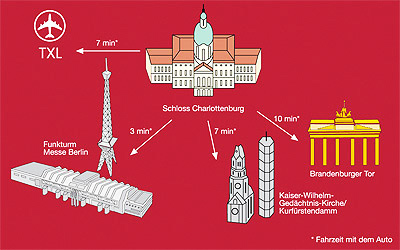 From there, you can walk through the palace gardens to the Christmas market (entrance off Pulsstraße). For visitors with a disability or using a wheelchair, there is an additional disabled WC in the hygiene village at the park’s western entrance, right next to the Royal Christmas Market for Children. We also provide ramps for wheelchair guests visiting the marquees. Bike stands are available at the eastern end of the market (just behind the fence, next to the large lawns). For security reasons, bikes parked on the premises are removed at the owner’s expense. Out of consideration to other visitors, please refrain from bringing dogs to the Christmas market! Our Christmas market also has an EC cash machine for disabled visitors! We recommend our visitors to arrive to our Christmas market expressly by public transport, as the parking on site is limited. Traffic junction with east-west connection, motorway junction (BAB), 3 Min. 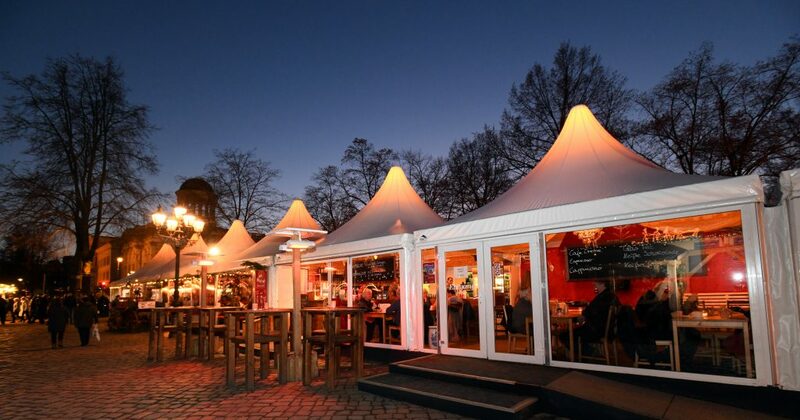 Culinary delights at Berlin’s finest winter open-air restaurant! A great mix of Christmas decorated and well heated marquees with impressive, individually designed wood cabins at the central palace square – a place to spend an afternoon enjoying the café atmosphere and international dishes, ranging from small snacks to lavish Christmas menus. Sample delicious specialities from various regions, along with a fine wine or an exquisite spirit. For winter cuddles and Christmas dreams! 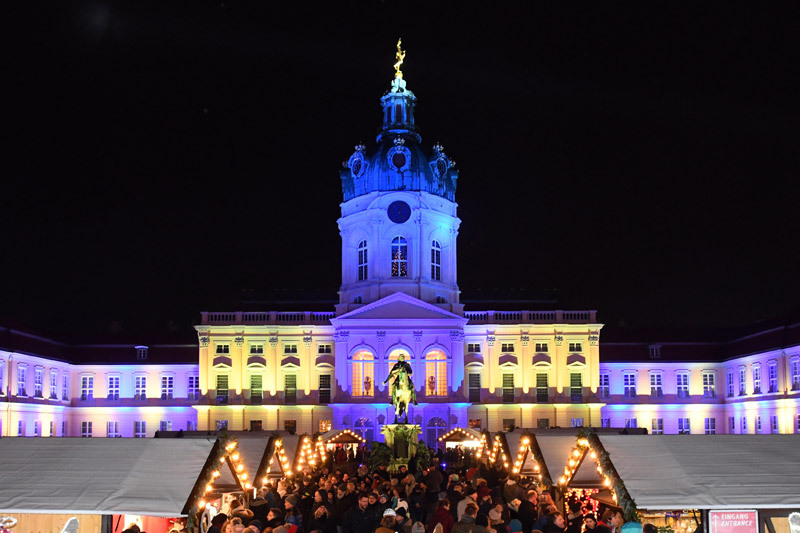 The idea of the Charlottenburg Palace Christmas Market was conceived as early as 1999. The organiser demonstrated exceptional perseverance, for it took eight years of planning to prepare the elaborate concept and intricate location. The eventual premiere in 2007 started with a bang, inspiring visitors and the press alike! I agree that my information will be stored and used to process my request and contact me by phone or e-mail. A transfer of my data to other third parties does not occur. I can withdraw my consent at any time free of charge and without any disadvantage with effect for the future. By confirming this declaration of consent, I expressly declare my consent to the use of the data for the above purpose. I have read the Datenschutzerklärung and accept them.